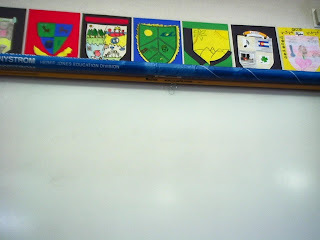 I gave the students lots of time to get their Coat of Arms finished today. Many students did get done (see photo at left) and I have begun putting the finished products on the wall. They look great! I was really impressed by the focus and productivity displayed during worktime as well. Many thanks to all classes for their effort. I look forward to learning more about each student as they present thier work to the class.